By definition, an emergency requires prompt and careful attention. That’s exactly what you’ll find when you make Dr. White your emergency dentist in Asheville. If you or a loved one is dealing with a dental emergency, call us immediately. We will be able to advise you and schedule a same-day appointment if necessary. Some people wonder whether or not they even have a dental emergency. Of course, some situations are more obviously emergencies than others, such as a knocked out tooth. A lost dental crown is certainly inconvenient, but it is not necessarily an emergency. That’s why it’s so important for you to call our office, so one of our knowledgeable team members can guide you through first aid and pain management steps over the phone. In cases of dental emergency, Asheville dentist Dr. John White can help. There are, however, times when you should head to the nearest hospital emergency room. If you are experiencing excessive bleeding, if you might have a concussion from a hard blow to the face or head, or if you think that you may have broken your jaw, then seeing an E.R. doctor is appropriate. Our team will be here to help once your overall health is not at risk. You just bit into an apple, but you pulled away a piece of your tooth. What now? Broken teeth can be repaired using tooth-colored, composite resin fillings or custom crafted dental crowns, depending on the extent of damage. If your broken tooth has sharp edges that may damage surrounding teeth and other oral structures, you can bite down on gauze or place orthodontic wax over the sharp parts of the tooth until you reach our office. If you have a piece of food or other foreign debris stuck between teeth, you can floss around it, brush the teeth, and swish water or mouth rinse. However, don’t use sharp tools to attempt to dislodge it as this can cause unintentional damage to soft tissues. In our office, we can carefully remove the stuck item, and we’ll provide deep cleaning to ensure your complete oral health. 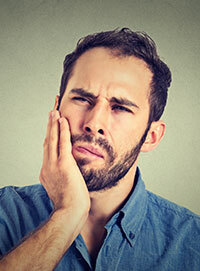 If you’re experiencing severe toothache or sensitivity to changes in temperature, you may need a root canal. These advanced restorative dentistry services are necessary when decay or damage reaches the inner layers of teeth where the nerve system is housed. Damage that accesses the nerve can be extremely painful, so we will remove the pulp and nerve tissue, refill the tooth, and place a dental crown to protect and strengthen the treated tooth. A broken or bent denture can be uncomfortable, but it can also damage your soft tissue and any remaining healthy teeth. Let our team know right away if your partial or full denture is damaged, and refrain from wearing these damaged prosthetics until they’re repaired. If you’ve lost a tooth, we offer a variety of replacement options, including fixed bridges to restore one or more consecutive teeth and partial and full dentures to replace larger numbers of missing teeth. We also offer dental implant supported crowns, bridges, and dentures for optimal oral health and function. For many patients experiencing severe toothache pain or dental sensitivity associated with tooth decay, chips, and cracks, a root canal is necessary to repair the tooth. This procedure has a painful reputation, but the treatment process is minimally invasive. 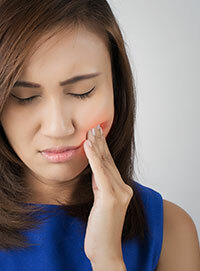 Root canal therapy simply involves removing the nerve tissue that causes pain and inflammation. Once the nerve is removed, we’re often able to save a tooth that would have been extracted. Best of all, most people have a dramatic decrease in discomfort immediately after root canal therapy. As with any emergency—medical or dental—the key is to be prepared. Knowing what to do in case of an emergency is half of the preparation. Until Dr. White can see you, here are helpful tips. First, stop the bleeding. Apply firm but gentle pressure with a pad of gauze or a clean cloth. You should see bleeding begin to slow or even stop within 10 minutes. If not, head to the nearest emergency room. Secondly, if the emergency is a knocked out tooth, handle the tooth with care. Try to touch only the crown, because delicate tissue may still be attached to the root. Clean the tooth with water only and try to reinsert it back in the socket. If bleeding or pain prevents this, then store the tooth in a sealed container filled with milk. Finally, always remember to be gentle. Don’t force a dislodged tooth back into place, and never use anything sharp when trying to remove something stuck between two teeth.